1870s/1880s autograph album that belonged to Margaret Elizabeth Edwards, "Lizzie", before and after her marriage to professor Enoch C. Lavers. She started the album in January of 1876 and may have received it as a Christmas present. The album's dedication was written by D. M. Miller, who may have been the person who gifted the album to Lizzie. The album measures approximately 6-3/4" x 4-1/4" and contains the sentiments of over 60 of Lizzie's relatives, friends and teachers. An alphabetical surname list and an alphabetical list of the signers, together with any personal information they offered, appear at the end of this post. Margaret Elizabeth Edwards was born in November 1853 in Pennsylvania, perhaps Indiana County, the daughter of David and Harriet A. (Patterson) Edwards. 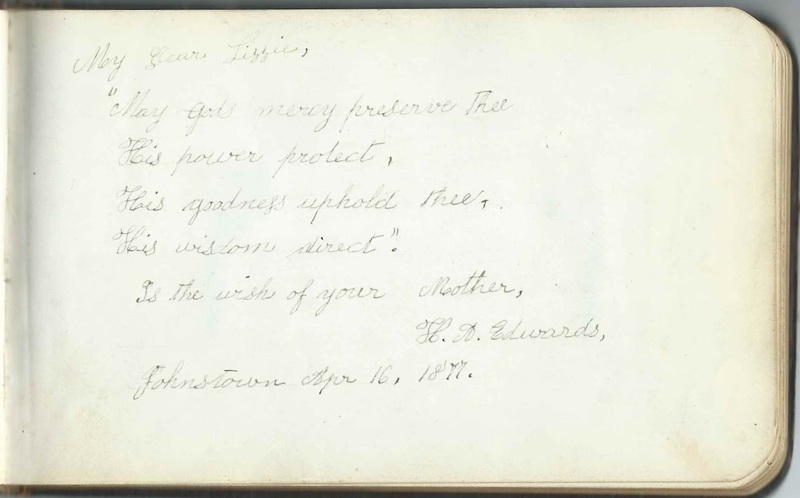 Harriet signed a page in her daughter's album at Johnstown, Pennsylvania, on April 16, 1877, as H. A. Edwards. Jonathan Dean Edwards; he and his future wife Dorothy A. Downey signed pages in the album. Emma Jane Edwards; she and her husband James Amberson Hood signed pages in the album [images below]. Thomas Patterson Edwards; he signed an individual page and a group page. Mary A. Edwards; she and her future husband Charles A. Wehn signed pages in the album. Ella Carrie Edwards; she signed an individual page and a group page. 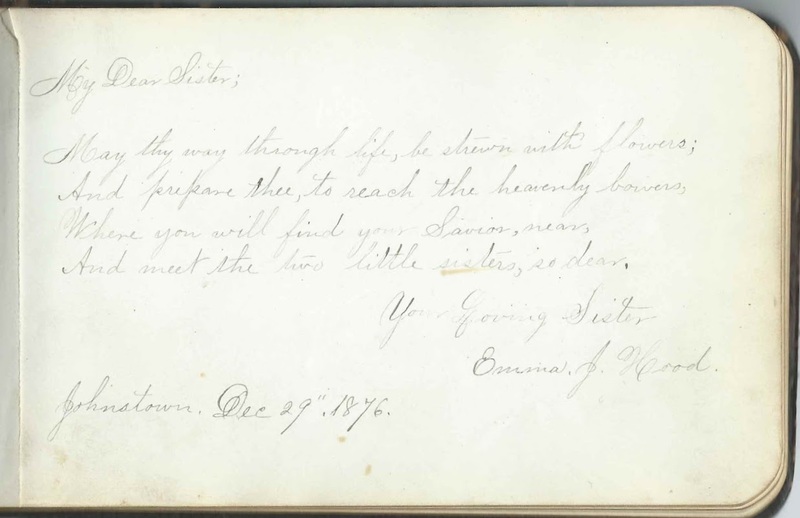 Sister Eliza Jane (Edwards) Hood inscribed a page at Johnstown, Pennsylvania, on December 29, 1876. The James A. Hood of Indiana, Pennsylvania, who inscribed a page on June 8, 1878, was presumably Emma's husband James Amberson Hood. About 1878, Margaret Elizabeth Edwards, "Lizzie", married Enoch C. Lavers, son, I believe, of English immigrants Richard and Eliza Lavers. Enoch was born in May 1853 in Connecticut. He became a noted college professor, usually known as E. C. Lavers. Lizzie and Enoch had at least five children, some of whom signed a group page with Lizzie and her siblings Thomas Patterson Edwards and Ella Carrie Edwards. The children who signed were E. Gertrude Lavers; Eliza A. Lavers; and Earl Roy Lavers. At that point, the two youngest children, Guy E. Lavers and Harold R. Lavers either hadn't been born or were too young to write. I'm not sure who R. Frank. Lavers was - a child of Enoch and Lizzie that I didn't find a record of or a brother or nephew of Enoch? Enoch died in 1932 and Lizzie in 1942. If you have corrections and/or additions to the information above, or information on any of the signers listed below, please leave a comment or contact me directly. J. Wharton Bradley, signed at Christiana, on February 22, 1887: Inscribed to "Sister Lavers"
Dorothy A. Downey, signed on March 27, 1878; in 1878, she would marry Lizzie's older brother Jonathan Dean Edwards. Ella C. Edwards of Johnstown, Pennsylvania, signed on March 30, 1878; "Darling Sister". Lizzie's sister Ella Carrie Edwards. "Your Loving Sister" Emma J. Hood, signed at Johnstown, Pennsylvania, on December 29, 1876. She was Emma Jane (Edwards) Hood, wife of James Amberson Hood. E. Gertrude Lavers; Lizzie's daughter. She shared the page with A. Rose Quinn and Eliza A. Lavers. Eliza A. Lavers; Lizzie's daughter. She shared the page with E. Gertrude Lavers and A. Rose Quinn. M. Lizzie Lavers; Lizzie herself, on a page shared with her children. Cherubs traced by Jennie Macneal, possibly the same Jennie Macneal who inscribed another page. D. M. Miller: Dedication of the album and explanation of the word "Autograph" from its Greek roots. Maggie W. Walters, "A teacher", signed at Johnstown, Pennsylvania, on November 29, 1877, "Thanksgiving"
Charles A. Wehn, signed at Johnstown, Pennsylvania, on August 15, 1877. He married Lizzie's younger sister Mary A. Edwards about 1878. E. C. Yerkes, signed at Christiana, Pennsylvania, on March 4, 1882; Lizzie's pastor.